Be warned, talking about The Beginner’s Guide means talking about specific parts of the game. Spoilers will follow, though you may not fully understand them, and I fully recommend you play the game first before reading this. Indie game development has had a spotlight on it for a while now. People know more about these indie studios, and individuals, then ever before and, with social media being what it is, it’s even easier to get inside looks at their personal lives. The Beginner’s Guide takes that truth and creates a video game around it. Going in blind is the best way to experience this game so before we get into it, be sure to stay away from videos or spoilers, this is an experience you should have fresh in order to fully immerse yourself in it. This is a game that tells a story that is often shied away from, a story that deserves to be told but can often come across as whining. After all, people who make video games for a living shouldn’t complain about making video games for a living…right? The Beginner’s Guide not only challenges that notion but does so in a way that will make you feel for creative minds of any kind, developer or not. Davey Wreden, writer of The Stanley Parable, is back at it again with The Beginner’s Guide and aims to look at game development through a different lens. 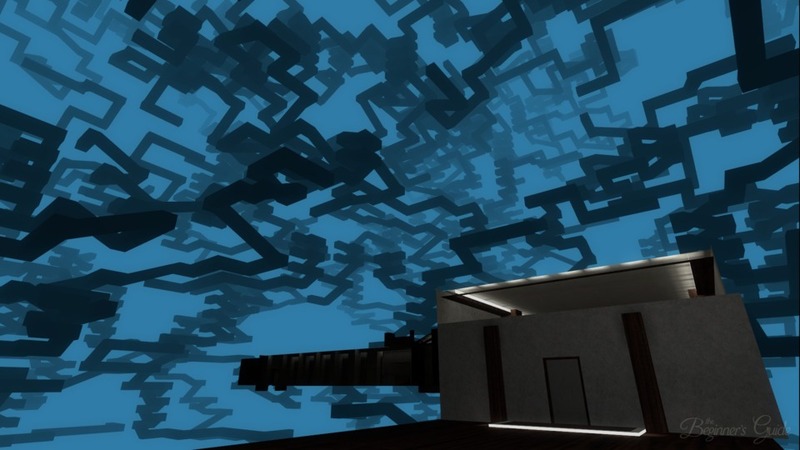 Where The Stanley Parable made jokes around game development and tropes in games, The Beginner’s Guide looks at game development as an extremely personal and tasking process. There are some jokes and laughable moments but it doesn’t feel right to laugh as everything in The Beginner’s Guide is clearly carrying a somewhat somber tone. Coda, the developer that Wreden introduces to us through his early games, is an indie developer that has stopped making games. Wreden is hoping to show the world his work so that Coda comes back to developing. And so the player begins a strange journey through Coda’s indie games, none of which had been released up until this point. Right off the bat the fourth wall is taken down as Wreden begins to speak to the player as they walk around Coda’s first game. Wreden explains what he likes about the game, a colorful version of Counter Strike’s de_dust2, and begins pulling the player through game after game, all developed in Source. Like literary analysts have done for years, whether right or wrong, Wreden’s goal is to analyze Coda through his work and figure out who this person is and what is going on in his head. His level design is so interesting and unique that Wreden feels Coda can be better understood through his creations, and that’s the reason this collection exists. From 2008 to 2011 you walkthrough all of Coda’s strange games, all the while Wreden narrates what’s interesting about them. Wreden seems to have deep, personal insight into Coda’s life and is able to explain why games were created in certain ways. The games themselves are never much more than mundane levels with simple puzzles. Coda doesn’t come across as someone setting out to make the next AAA title, but rather a person who is developing things he enjoys. For better or worse, Coda is like an author that jumps from story idea to story idea, never fully finishing a project he starts up on. These small details are giant comments on the developing world as a whole, and that probably goes for most creative people. It can be easy to get caught up on the “new thing” and leave your old project behind, and Coda seems to do that a lot. Certain levels interested me more than others and Wreden’s explanation of them did a lot to make me better understand this mysterious developer, or so I thought. As I said, the worlds are made in Source so don’t come to the game expecting the most gorgeous game around. It’s very much a letter, not necessarily a love letter, to developing games. Coda knew what he liked and worked on that, whether others enjoyed it or not was not his main goal. Instead, he just wanted to create. Story drives The Beginner’s Guide in a big way and Wreden does a great job of narrating. Other than Wreden, there is little to no story aside from what you can personally glean from the worlds that Coda creates. While Wreden has his own interpretation of what Coda is going for, you may think something vastly different and that’s alright. Coda is supposed to be a human and we don’t all read each other the same way. In fact, there are times when we think one thing and the exact opposite is true. Just because someone develops prison worlds over and over doesn’t mean they’re depressed or feel alone, but Wreden seems to think so. The differing of ideas between Wreden’s design philosophy and Coda’s becomes more and more clear as the game progresses. This devolves into a rather on-the-nose delivery of the issues between the two supposed friends. If you’re paying attention during the game you can probably see this coming, it’s not meant as a twist, but the lack of subtlety can be a bit jarring in relation to the rest of the game’s careful dialogue. With that said, the overall effect of the game is substantial and meaningful. The Beginner’s Guide starts a dialogue that isn’t talked about much in gaming and it’s that of a developers life and psyche. Creating a game can be tiring and doing so with people breathing down your neck to make the next great thing, or at least sell X number of copies, is even more complicated. Seeing that truth from a developer’s perspective is a beautiful process that really hit home with me. I don’t think I’ve ever played a game like The Beginner’s Guide and I’m not sure any game will ever need to duplicate what it accomplished. Could the delivery at the end be better? Sure. Were there some elements that seemed too on-the-nose? Yes. Does the overall message come across in a meaningful and hard-hitting way? Absolutely. And that last question is the only one that really matters. But at the same time the unfortunate business model of Hero League and the sense of the grind in this meta-game of collecting and leveling up heroes takes the fun out of the parts that are enjoyable. Perhaps with time Heroes of the Storm can age into something great, for now it’s worth checking out if you want to experience a different take on a popular genre. The Banner Saga isn’t your run of the mill RPG where you are chosen to save the world. Instead, it’s a world where everything is slowly going down the drain and all you can do is watch and hope that somehow, someway, you can escape this hell on earth.